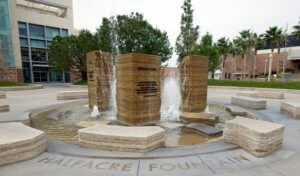 When Chapman University wanted to redo the fountain at the entrance to their campus, they decided to include visual fog effects. They started with a poorly designed, inexpensive solution, but that ultimately didn’t work out. The fog system eventually broke down and they were faced with costly repairs. We hear this all too often; a client or client’s designated contractor decides to go with a low-cost alternative, that is designed poorly or built for cost and it doesn’t perform. When choosing a fog or misting system, it’s important to make the right choice the first time. Fortunately, Chapman decided to give Koolfog a shot and we ended up replacing the system. The fountain is now a beautiful welcoming effect to students and visitors alike. It might be tempting to go with one of the other guys, but Koolfog is always the right choice when it comes to fog or misting systems.